Good museum, good show. If you are getting there on hop on/off bus, buy the tickets together to get a discount. Amazing ! 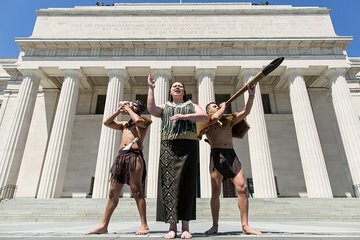 Do not miss this incredible museum and Maori performance . You can get your picture with performers after show. Outstanding museum and wonderful cultural show. Make sure u do this one. We booked this before leaving home because we were only in Auckland for one day on a cruise ship stop and didn't want the performance to be sold out. We had a look around the museum before returning to the lobby at our appointed time. Then the performers come out in their native dress --or lack thereof lol -- and lead you back to a small theater area. We were surprised how small the stage was...had been expecting something on a larger scale but that made it even better. I was able to sit in the front row and get great video footage of the haka war dance. The best thing was the personality of the performers and the humor they injected as they shared their culture with us. Certainly not dry and boring. The only thing that took away from the experience was finding out that these very same performers were giving a FREE show back at our cruise ship later that day. So we could have seen them for free had the cruise line let us know they planned to do this. Check with your cruise line first before booking this, but if they don't offer it then I would highly recommend this since your ticket also gives you all day access to the museum. I'm a bit biased because I had just come from Rotorua the day before and visited a Maori village there, so I was comparing the Maori show at the museum vs actual Maori people living and performing their cultural heritage to tourists. Objectively though, this performance is a good, humorous introduction to the different dances, songs and performance tools the Maori use, kind of like a Maori lite guide and isn't too long which suits well for families, children and others who are a little short on time. You also have a chance to talk with the performers and take pictures too which was nice to learn about the performers and why they decided to learn Maori dance and spread the culture. The museum itself was lovely, many different exhibitions and I enjoyed the history of music exhibition very much. Great museum but recommend doing the 1 hour guided tour as well as you get to learn a huge amount. The cafe did good food at reasonable prices. A wonderfull museum and the performance simple but nice.